No matter how well-organized and efficient the other departments of your organization are, the real success of a business and its products or services depends on how productive and well-oiled its sales team is. The sales team, by and large, has the most unique role to play in an organization. It is responsible for converting leads into sales and building trust and loyalty between the customer and the organization. To continue doing well and maintain consistency, it’s essential that a sales team should learn to adapt to new changes and strive to learn new techniques for increased efficiency and productivity levels. As it is, every member of your sales team, regardless of their designation or job description, can greatly benefit from new ideas and fresh perspectives. Today, a great variety of resources are available for salespersons to hone their skills. However, even in this digital age, the best way to learn marketing and sales is via books. A wide array of books are available on sales and marketing that offer a plethora of knowledge and information about developing effective customer relationship management (CRM) and pipeline management. So, reading such books will not only make you learn new concepts but will also widen your expertise and help you master the fundamentals of sales too. To enhance your capabilities as a salesperson, here are 6 of our favorite books that contain invaluable insights and advice from some of the sales and marketing giants in the industry. Those in sales are already well aware of how frustrating and challenging this field can be. In his book, sales guru Brian Tracy gives you some practical strategies and methods based on his experience that can help you increase sales much faster and easier than you ever thought was possible. This book highlights principles that will help you present yourself in a way so as to allow you to better sell yourself and your ideas, which, consequently, will help you boost your sales. The book provides insights into customer psychology and how a salesperson can overcome the barriers that stop a prospect from proceeding with the purchase. Moreover, it also sheds light on how a seller can manage their own psychology and remain confident in the face of rejection. This book also provides ways in which a salesperson can increase their effectiveness and communicate the features of their products and services in a way that ends up in closing the deal successfully! All in all, it is a must read for anyone in sales or even business management because it offers practical advice to learning the art of selling. This classic sales book touches on the key aspects of selling and closing the deal by focusing on the art of effective persuasion. It includes various psychological facets of making and closing a deal. Ideal for rookie salesmen seeking professional advice, this book provides more than a 100 ways to make a sales pitch and how to close deals depending on the circumstances. Additionally, it has several anecdotes from the author’s own life as well as practical advice from over a hundred of America’s most successful salespersons. The book is not lacking in humor in the least; it is a fun, entertaining read, and is also, informative and educational. So, if you’re looking for some protips to help you get the edge and to lock in that deal, this is the book you definitely want to get your hands on! This incredibly actionable read by Mike Weinberg focuses exclusively on acquiring new business. This book offers straightforward and sensible advice for business development. It gives play by play suggestions to sales teams on targeting potential prospects, planning an effective stratagem, pitching the right deal and finally, closing the sale. In short, it provides a simple yet viable approach to creating an operational sales pipeline. What sets this book apart is that it is well structured, has minimal fluff and is not overly complicated. The author points out the fundamental tasks that salespersons must consistently follow in order to excel in their field and also highlights some of the common mistakes reps and even executives make that should be avoided. All in all, this book is a must read as it contains a goldmine of wisdom for sales teams and business owners, especially those looking to draw in new clients. Gitomer’s conversational style makes this one an easy read. It is chock-full of great advice and interesting selling maneuvers that can prove to be beneficial for everyone – whether in sales or not. It emphasizes on the importance of having a positive attitude and being creative yet different. Additionally, it engages the clients in such a way that they convince themselves to buy the product as opposed to you convincing them. Also, reading it helps salespeople build a network and motivate them on how to always be on the lookout for opportunities. For those who are not big on reading but still wish to know great selling tips – this is just the book for you! Short, sweet and to the point - it should definitely be on the book shelf of every salesperson! SPIN Selling is one of the few sales books that is based on data and research. While most books concentrate on small sales, this one deals with large, more complex sales. It is based on thorough investigation of over 35,000 sales calls in order to isolate the factors that make for a successful sale. The author emphasizes on the need to ask the right questions and also provides a systematic approach for questioning, using the SPIN model. According to the author, asking the right questions will draw the customers in, which will essentially lead them to talk their own selves into buying the product. This book is abundant in knowledge and provides proactive insight that can be helpful to everyone in this field, be it a sales rep, a sales team manager or even a business owner! The Challenger Sale bases its guidance and conclusions on hard data, research and provides good direction for a sales rep looking to excel. Compiled using the insight of over hundreds of successful sales representatives, it provides an unconventional take on what makes a successful salesperson. The book suggests that a top sales rep should be able to challenge the client in a way that provokes them to think differently and should make the client perceive their offering in a valuable way. It provides precious insights and several recommendations that challenge the traditional assumptions about selling success. So, if you want to try a new tactic to improve your sales, this is the book you should pick next! The success of a business depends on the revenue its sales department generates. For the growth and progress of a sales team, all members must be willing to put in extra effort towards self-development to improve themselves. 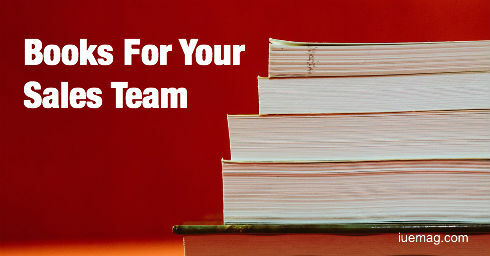 The books mentioned in this article can make a huge difference in the productivity and motivation levels of your sales team. The actionable advice will help salespeople try the techniques proved worthwhile by some of the best minds in the industry. Any facts, figures or references stated here are made by the author & don't reflect the endorsement of iU at all times unless otherwise drafted by official staff at iU. This article was first published here on 9th May 2017.